In light of the Paris Agreement on Climate Change, Gold Standard is collaborating with the Science Based Targets initiative to reposition voluntary offsetting as a tool for companies to play a role in driving climate finance to reduce global carbon emissions and helping vulnerable communities adapt to climate change. This is the first in a series of editorials that address historic challenges within the voluntary carbon market and position market mechanisms effectively within climate finance. A public consultation to gain feedback on the initiative will be launched on 21st September at a workshop at Climate Week NYC. This spring, I finally witnessed in person the spirit of Gold Standard projects. And at the same time I realised why more companies aren’t supporting them today. The project activities are truly inspirational. Improved cookstoves are helping to drive an urgently needed transition to a low-carbon future. More importantly, they are improving quality of life, supporting livelihoods, and in some cases even saving lives. We place these life-changing impacts on a ledger, counting against a company’s pollution. This bears little connection to what funding an emission reduction accomplishes toward climate security, and even less the real human lives affected on the ground. Quite frankly, it debases what we’re all trying to achieve. The levels of benefits provided by cookstove projects are like peeling back an onion. Even while driving to the project site in Teyateyaneng, Lesotho on an April morning, I could already detect the outer skins. You can see the collateral damage to local air quality and the levels of deforestation from cooking over open stoves literally from miles away. Throughout the region, you can often tell at a glance which communities a cookstove project has reached and which communities are still burning wood every morning, every day, every night to feed their families. I arrived (after an unplanned and rather adventurous ‘shortcut’ over an unpaved mountain pass) to meet Itumeleng Kosie. A woman who is warm, generous, and highly intuitive but suffers no fools when getting a job done (she´s the one on the right!). Itumeleng’s job, specifically, is to manage the Save80 project—sponsored by Deutsche Post DHL and developed by atmosfair) and support the distribution and maintenance of approximately 10,000 stoves. She does this while negotiating local politics, educating communities, marketing and selling the stoves and tracking payments to ensure the project can be sustained over time. It´s a job that involves many intricacies that have to be carefully and continuously managed. First, she must convince people to care. These rural and often poor families must find the funds to pay for the stoves. They often view the trees around them as a limitless natural resource, even a gift from god, that can be chopped down and used for fuel. But they know, and already experience the effects of climate change – even if they don’t articulate it in scientific terms or call it by name. Smallholder farmers can no longer produce certain kinds of maize—a staple to the local diet. They have to harvest some crops earlier, often at lower yields, and others won’t grow at all. 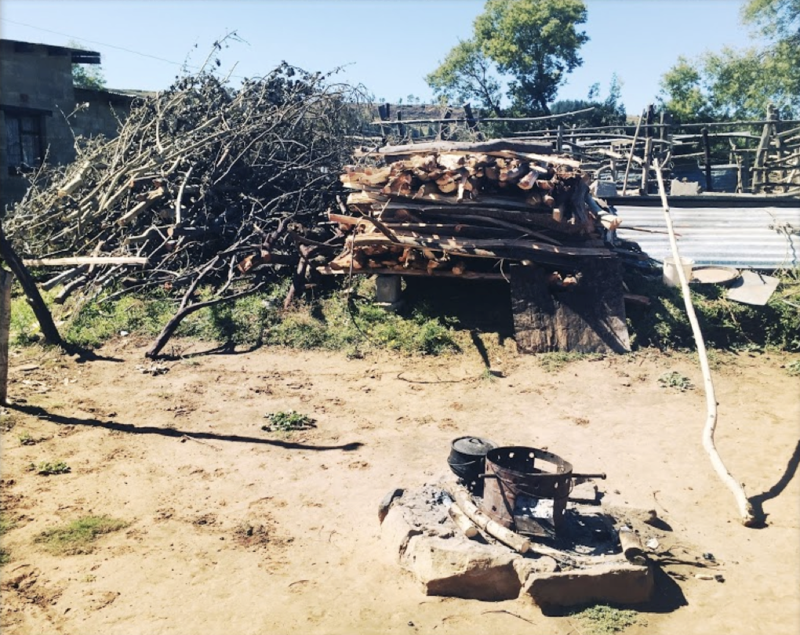 Itumeleng helps them make the connection between those struggles and the burning of wood for cooking. But she doesn’t have to sell the benefits of the stove. The women and, yes—sometimes the men—using the stoves told me what they liked. They’re safer: they don’t worry as much about burning themselves or their children. Not having to breathe suffocating smoke while doing daily tasks ranked highly. And not to be discounted: they like that it saves them cooking time. Some stove types even retain heat long-term so that they can use it to keep water warm – bonus! My gratitude to Itumeleng for spending her day with me—for making an exception in this case to suffer a fool who’s still a novice to the realities of projects on the ground. 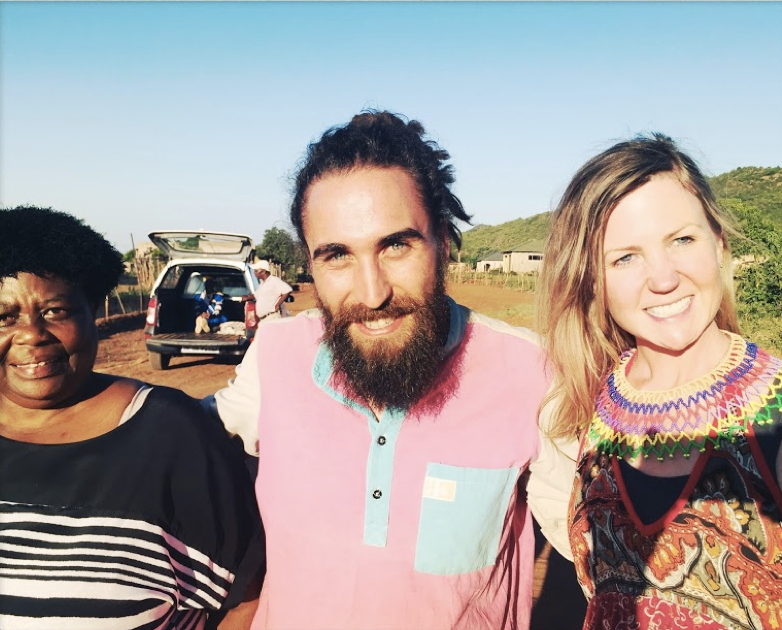 My next visit was to a Nova Institute cookstove project in Molati, northeastern South Africa. Nova programme manager Pierre Reyneke introduced me to Mary. Mary is a gentle warrior. She came out in the hot sun, all day, to share this project with us, despite feeling quite under the weather. Mary took us to her community. On top of this welcome, the banquet that they had prepared for the occasion was truly humbling. Fresh salad, beets, beans and rice, luscious morogo, braised beef, and the ubiquitous pap—all prepared on locally produced cookstoves—and over which we could speak to Mary and the women who had prepared the feast. Mary is intimately familiar with all the details of building the stoves, maintaining them over time and supporting the community as the project activity expands. This expansion requires technical insights required to successfully introduce new fruit tree plantings that provide fresh food and potential income over time, an innovation to deepen the project benefits to local families. She and Pierre led us throughout the community to more families who opened their homes and candidly shared their experiences with their cookstoves—and also their ideas for improvement. (Evelyn would like a stove that is suited for bread making, please and thank you). What I’d intuited from my second-hand knowledge of Gold Standard projects was now very clear. This is not about offsetting. It’s just not. It’s a fantastic practice, poorly articulated. We as an industry have failed them in spreading the message. I even heard a very smart woman from an organisation well known for their sustainability program and for their savvy marketing admit, “We don’t know how to communicate about this.” She also stated, almost defiantly, that once someone understands what the projects are about, no one can challenge a company’s support of them. We can’t take every person or even every business leader to Teyateyaneng, Molati, Honduras, Cambodia or to other projects on the ground. That’s why we need to do better. When I reflect back on the project visit, I blush at my level of unpreparedness. During my encounters with the community in Molati, almost everyone made some sort of offering—whether food and music or handmade goods like teak spoons or beautiful beaded necklaces. But I had brought none to share. So my gift back is this: to try to do my job better. To connect the dots between their experience with individuals and companies who can make a contribution. To ensure that their projects are supported and can grow to serve more communities that are shrouded in smoke every morning, every day, every night. To work toward climate security and sustainable development for all.